This is an English version of my Swedish homepage "Strömsträckan". 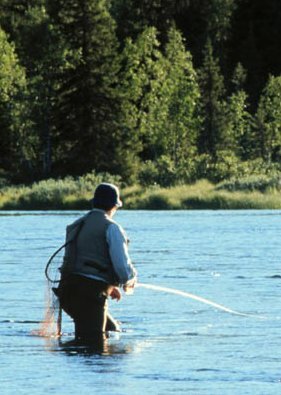 The main subject of this homepage is fly-fishing in rivers and streams in Norrbotten County in the very north of Sweden. Since I now live in Laisvall the main interest is focused on the Arjeplog area and my home river Laisalven. Some other rivers and streams I have visited in Norrbotten County are also briefly described. 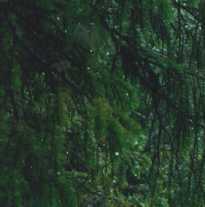 I also want to show the beauty of wilderness rivers and the surrounding nature. In words and with my camera I try to describe waterfalls and rapids as well as wildlife and flora. A way to preserve our last rivers from exploitation by hydroelectric power companies is to increase peoples interest in and knowledge about the rivers. I believe that fly-fishing is an excellent gateway for people to learn about the rivers and the surrounding nature. If more people like to visit our rivers, the interest to preserve them from exploitation also increases. The bad thing about this is the risk for overfishing and damage of the vegetation. This leads to the need of increased conservation work of fish and nature. It is my hope that this homepage can contribute to increase the interest of fly-fishing and also indirect to the preservation of the rivers. This homepage is my own personal initiative and has no connection to any company or organisation. Tapio is fly-fishing in the Lais River. 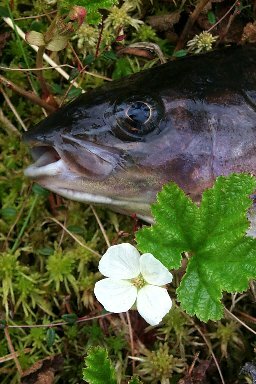 Grayling and flower of cloudberry.